Playing For Change releases third album in the midst of the Levitt National Tour! 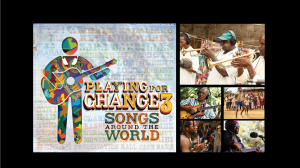 Today, global music sensation Playing For Change released its third album, PFC3 Songs Around The World, featuring 185 musicians from 31 countries united together through music. The album features artists Keb’ Mo’, Keith Richards, Los Lobos, Taj Mahal, Toots Hibbert, Sara Bareilles, Aztec Indians and the one and only PFC Band! Lucky for PFC fans, Playing For Change is headlining the Levitt National Tour this summer, which will bring this phenomenal band to six Levitt locations across America for free. Taking place over a three-week period, the tour stops at six Levitt locations—including Los Angeles and Pasadena, Calif.; Memphis; Arlington, Texas; Bethlehem, Pa; and the future site of Levitt Pavilion Denver (where audiences will get a taste of what’s to come when the venue opens in 2016)! Playing For Change performed at Levitt Steelstacks in Bethlehem last Thursday and will be performing this weekend at Levitt Shell Memphis on Friday, June 20th, and Levitt Arlington on Saturday, June 21st. While Playing for Change is traveling to over 40 venues as part of their Peace Through Music national tour, only Levitt venues will present Playing For Change concerts free of charge. Thanks to a grant from the National Endowment for the Arts and sponsorship by Remo, audience members will be treated to fun pre- and post-concert activities. Before each show, audience members will have the opportunity to participate in community drum circles on the Levitt lawn and learn the Levitt signature beat, no experience required! The first 250 guests at each venue will receive free REMO© sound shape mini-drums to take home. After the concerts, audience members will experience special Q&A session with the artists. You can listen to tracks from PFC’s new album online here and catch them live during The Levitt National Tour. This entry was posted in Concerts, Levitt Artists, Levitt in America, Levitt National Tour and tagged Levitt National Tour, Playing For Change on June 17, 2014 by Isabella Ramos.